Walk our sandy beach crowned by Haystack Rock an Oregon icon, and you will begin to see why we love this stretch of the Oregon Coast. Named one of the world&apos;s 100 most beautiful places by National Geographic, this remarkable landscape will simply take your breath away. The stunning coastline views and remarkable natural areas blend magically with our charming village by the sea where you can savor the culinary bounty of the Pacific Northwest, enjoy luxurious oceanfront lodging and explore one of the top art towns in America. It&apos;s just 90 minutes from Portland, but Light years from ordinary. Take your soul on vacation. 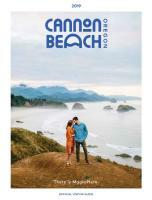 Experience Cannon Beach through the eyes of our visitors. It’s easy to enjoy the beautiful beaches, rocky shoreline and stunning views around Cannon Beach.